A 62-year-old man with a background of type 2 diabetes mellitus presented to the emergency department (ED) with a 5-day history of dental pain, progressive right facial swelling, trismus, dysphagia and voice changes. The oropharynx could not be directly examined completely due to trismus. The patient had a National Early Warning Score of 0 and so was triaged into the ‘minors’ section of ED. 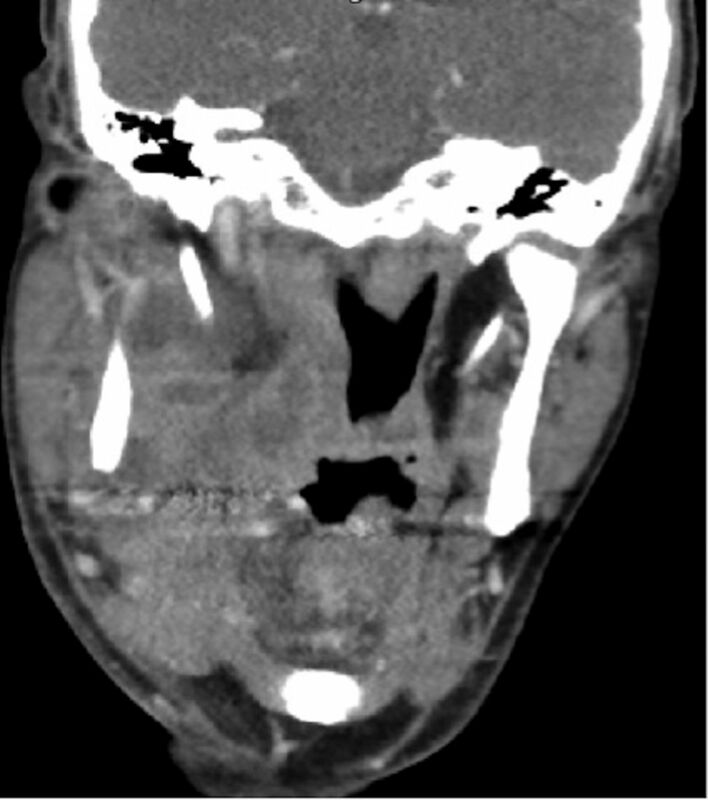 Following assessment by the on-call oral and maxillofacial surgeon, an urgent contrast-enhanced CT demonstrated a large parapharyngeal collection, which required urgent anaesthetic and surgical intervention. The patient developed pulmonary complications postoperatively, but eventually made a full recovery. Infections of the deep spaces of the neck are potentially life threatening and require urgent specialist intervention. Prompt recognition of deep neck space infections is mandatory; delay in treatment increases the risk of disease progression including airway loss and mortality. Treatment is primarily surgical, but it is important to acknowledge the advances in imaging and antimicrobial therapy that have reduced the morbidity and mortality associated with deep neck infections over the last 50 years.3 4 Despite these improvements, patients with infections of the head and neck spaces can decompensate dramatically if not identified and treated early. Decompensation can lead to airway obstruction, pericarditis, mediastinitis, septic embolisation, thoracic empyema, dural sinus thrombosis, intracranial abscess, septic shock and mortality.3 4 It is therefore paramount for primary care and ED colleagues to rule out any red flag signs and symptoms to enable urgent diagnosis and medical and surgical intervention. The National Early Warning Score (NEWS) was first designed in 2012 to help standardise identification of acutely unwell patients and takes into consideration the following parameters: respiration rate, oxygen saturation, systolic blood pressure, pulse rate, level of consciousness or new confusion, and temperature.5 This system provides an excellent framework for prioritising treatment in most medical emergencies, however, it does not assist the non-specialist in identifying the severity of localised deep neck infections or incipient threats to the airway. The presented case highlights the importance of vigilance in primary care and ED setting for signs or symptoms suggesting potential airway compromise. A 62-year-old man presented to the ED of a district general hospital in the UK with a 5-day history of dental pain and progressive right buccal facial swelling. He had attended his general dental practitioner (GDP) 3 days previously, having received a prescription for amoxicillin and metronidazole, which had not prevented the infection worsening. On presentation, he was able to tolerate oral fluids but had a 24-hour history of trismus, voice changes and dysphagia. The patient returned to his GDP and was referred to the ED as the trismus prevented adequate drainage in the primary care setting. The patient had a medical history of a stroke 3 years ago, diet-controlled type 2 diabetes mellitus, hypertension and ongoing chronic alcohol abuse. He was a non-smoker. On examination, he had trismus, with a maximal mouth opening of 15 mm, a large right facial swelling extending from the right infratemporal fossa to the right submandibular region (approximately 10×10 cm). The ED clinicians were unable to examine his oropharynx directly due to the trismus. His right mandibular second molar tooth was tender to percussion, and a firm collection was palpated buccally. He had a NEWS of 0 and a Glasgow Coma Scale of 15. As a result the ED triage nurse triaged him into the minors section of the Emergency Department. Blood tests confirmed the clinical suspicion of an acute inflammatory condition. Full blood count showed a haemoglobin level of 119 g/L, a white cell count of 17.1×109/L, with a neutrophil count of 9.5×109/L, and a platelet count of 575×109/L. Urea and electrolytes were normal, and the CRP was 145. 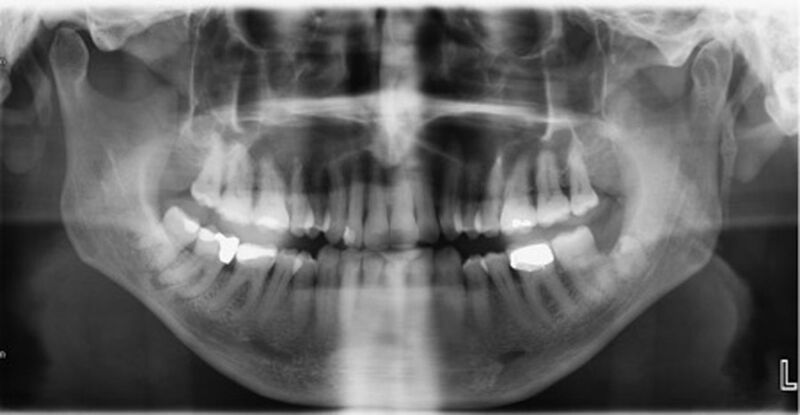 An orthopantogram (OPG) demonstrated periapical radiolucencies on both the lower right second and third molars, strongly suggesting an odontogenic source (figure 1). Urgent contrast-enhanced CT of the neck showed a large collection in the deep peritonsillar and parapharyngeal spaces (2.7 cm in maximum diameter), close to the pterygoid plates, and a superficial component buccal to the mandible (figures 2–7). Preoperative orthopantomogram showing periapical radiolucencies on both the lower right second and third molars, strongly suggesting infective pathology. 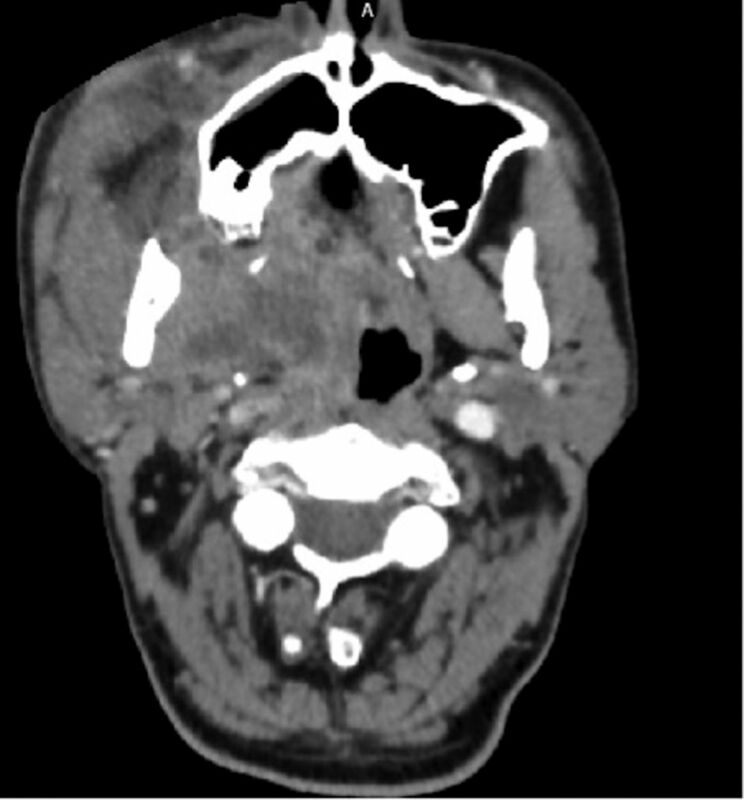 Axial view CT neck with contrast showing a large collection in the deep peritonsillar and parapharyngeal spaces. Axial view CT neck with contrast showing a large collection in the deep peritonsillar and parapharyngeal spaces, and a superficial component buccal to the mandible. 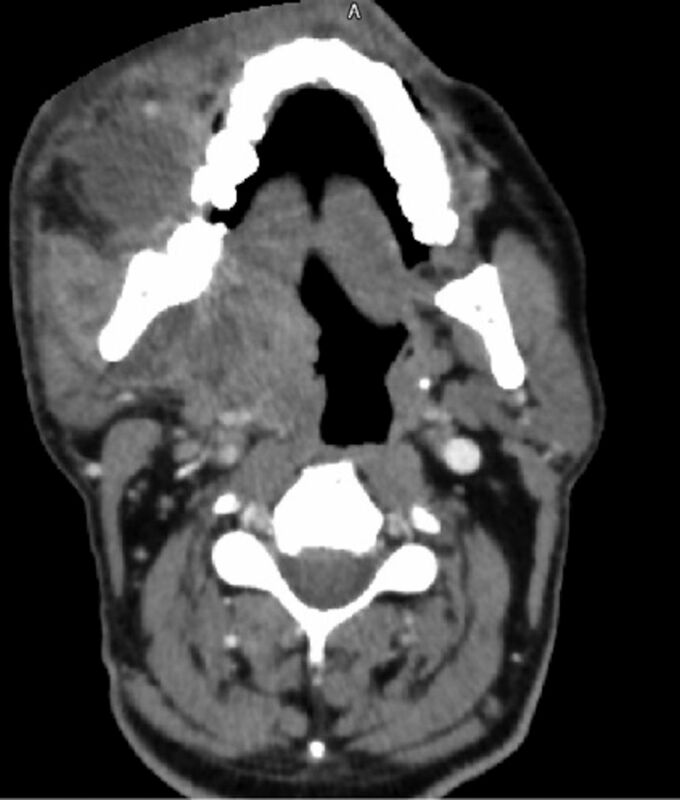 Coronal view CT neck with contrast showing a large collection in the deep peritonsillar and parapharyngeal spaces, and a superficial component buccal to the mandible. 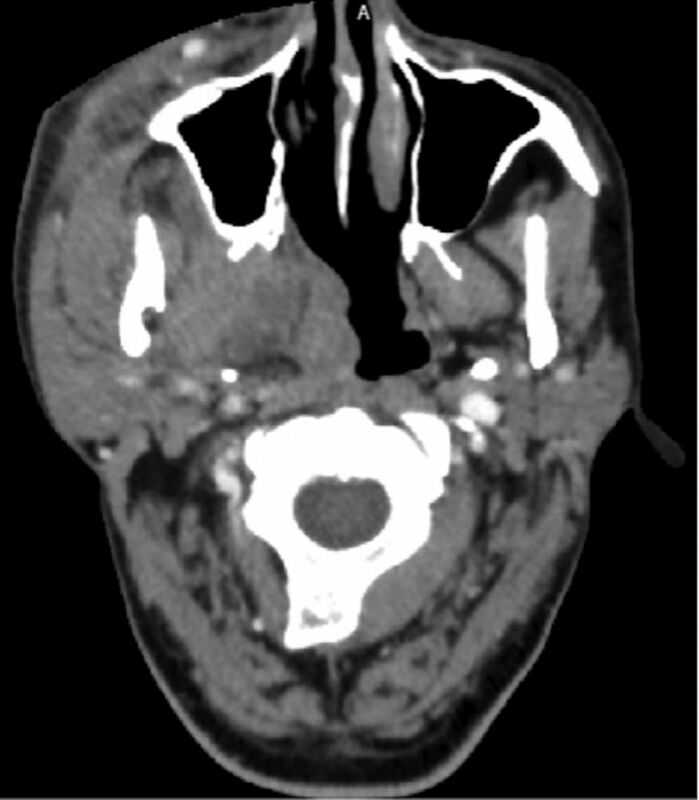 Sagittal view CT neck with contrast showing airway narrowing. A diagnosis of odontogenic parapharyngeal abscess was made. The oral and maxillofacial team made urgent arrangements for surgical exploration. He was given intravenous co-amoxiclav and dexamethasone. An urgent awake fibre-optic intubation was carried out successfully but was difficult due to the degree of trismus and oedema. Examination under anaesthesia showed improved mouth opening of 50 mm and a parapharyngeal swelling, with extension to the soft palate, crossing the midline. The lower right second and third molar teeth were identified as the causative teeth, and extracted. A generous intraoral incision was made to allow exploration of the tissue spaces. The buccal, submandibular, submasseteric, masticator and parapharyngeal spaces were explored with gentle blunt dissection, releasing copious pus. An intraoral drain was placed buccally. The patient was initially recovered in intensive care and was extubated and transferred to the head and neck ward 2 days later. That evening, he developed breathing difficulties. He appeared tired, sweaty and was using his accessory muscles to breathe. His respiratory rate was 24 and his oxygen saturations were 82% on room air, improving to 96% on high flow oxygen via a non-rebreathing face mask. Breath sounds were clear on auscultation. He was diagnosed with type 1 respiratory failure, and transferred to the surgical high dependency unit. The chest radiograph, ECG and CT pulmonary angiogram were all clear. The respiratory failure was therefore thought to be due to airway oedema. The patient received regular chest physiotherapy. He was reviewed by the speech and language team, who felt that he had an effective, safe cough. The patient then made a good recovery and was discharged 2 days later. 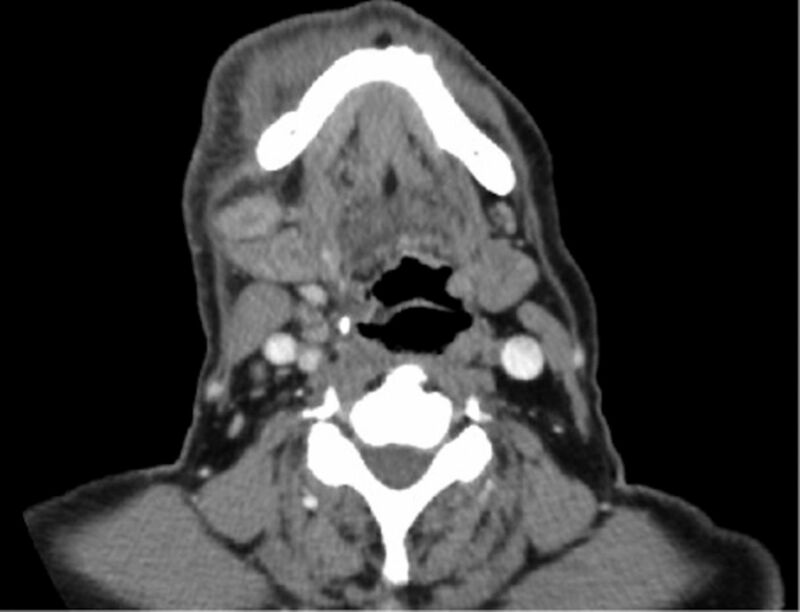 This case is illustrative of how patients can present with severe localised deep neck space infections, but with little evidence of physiological compromise even at a late stage. We hope that this will be instructive to individuals working in primary care or emergency medicine settings, and we identify a short list of ‘red flag’ symptoms that should prompt triage to a severe category, and urgent referral to the appropriate specialty. The NEWS algorithm was introduced in 2012 to allow prompt recognition of acutely unwell patients, with particular emphasis on the recognition of patients with Systemic Inflammatory Response Syndrome (SIRS), a common and life-threatening complication of aggressive or inadequately treated infective processes. NEWS is now a standard tool within UK healthcare.6 However, in deep space infections of the head and neck, the close proximity of vital anatomical structures, in particular the larynx, means that local compressive and inflammatory effects of the disease can cause airway loss rapidly, before signs of SIRS become evident. We propose therefore a simple addition to evaluation of patients who present with any history of potential infection in the head and neck region. Primary care, emergency medicine or nursing staff with a triage role should specifically seek and document evidence of the ‘red flag’ signs and symptoms demonstrated in box 1. If any of these are present, patients should be escalated to an area where close observation is possible and the appropriate specialty informed as a matter of urgency. Within the UK, this is usually the oral and maxillofacial surgery, or ear nose and throat (ENT) team, dependent on the suspected source and local protocol. Signs and symptoms of systemic sepsis must also be sought, but these are identified by NEWS; this list helps to identify local effects that could potentially affect the airway. NEWS, National Early Warning Score. Historically, a planned surgical tracheostomy was the airway management technique of choice for all deep neck infections. However, practice has now shifted towards avoiding elective surgical tracheostomy as it can has the potential to cause communication between the abscess and adjacent tissue spaces, and awake fibre-optic intubation is both less invasive and potentially safer in the presence of distorted neck anatomy.4 8 However, awake fibre-optic intubation is a difficult technique, requiring an experienced anaesthetist and dedicated equipment. In addition, it can be uncomfortable and distressing for patients.9 When awake fibre-optic intubation has failed, a planned surgical tracheostomy is often indicated.2 This possibility must be discussed at the preoperative WHO briefing. Elective tracheostomy placement provides the most secure airway and can allow earlier transfer to the head and neck ward from the intensive care unit reducing costs and freeing up scarce critical care resources.5 However, these advantages must be weighed against the substantial risks of tracheostomy, including bleeding (which can be potentially fatal), scarring, pneumothorax and tracheal stenosis. Ultrasound can be useful for demonstrating drainable collections however, due to anatomical constraints, it can be difficult for evaluating deep structures of the neck,9 and the pressure of the ultrasound probe on inflamed tissues can be very painful for the patient. Postoperative imaging can be useful at showing any postoperative complications where it is useful beneficial to diagnose early to reduce significant morbidity and mortality.12 However, in the UK postoperative CT imaging is not routinely performed, due to the increased radiation dose to the patient and financial constraint, relying instead on clinical examination and trends in blood tests. Colleagues in both primary care and the ED should assess for these red flag signs and symptoms as part of the triage process to help ensure that these patients get an urgent surgical and anaesthetic review and are placed in the appropriate area of the ED. NEWS cannot be used alone to demonstrate the severity of deep neck space infections. Imaging can be useful but should not delay urgent medical and surgical intervention if the clinical diagnosis is clear from a thorough history and examination. Prompt recognition of deep neck space infections is mandatory; delay in treatment increases the risk of disease progression including airway loss and mortality. Algorithms designed to detect systemic physiological upset do not always reflect the severity of localised deep neck infections. National Early Warning Score cannot be used alone to assess severity of deep neck space infections, and further work to design and evaluate appropriate algorithms is needed. An ideal algorithm would ensure that patients are treated in the appropriate area of the hospital, and referred promptly to the appropriate specialists.
. Outreach and Early Warning Systems (EWS) for the prevention of Intensive Care admission and death of critically ill adult patients on general hospital wards (Review). chochrane Libr 2009;1:26. Contributors EW: planning, conduct, reporting, conception and design, acquisition of data and interpretation of data. JH: planning, conduct, reporting, conception and design and interpretation of data. AK: conduct, reporting, conception and design and interpretation of data. KMV: conduct, reporting, conception and design and interpretation of data.